Setting the table in a perfect and original way is an element of distinction that will be appreciated by your diners and will make your offer unique compared to competitors. For table settings, rather than being guided by savings, make diners’ time at your premises comfortable, with care for every detail. Setting the table is an art that requires precision, elegance, originality and attention to detail. Only with the right devices can you create the right atmosphere to offer a perfect experience. 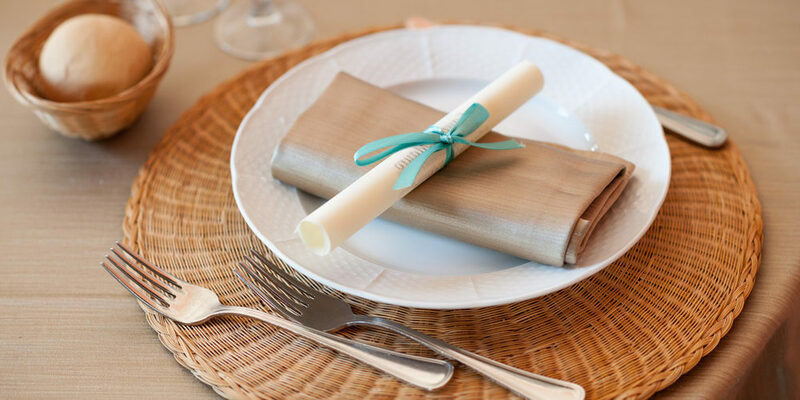 Each restaurant has its own style, from the choice of place settings, colors of tablecloths and napkins, but it is recommended to follow some basic rules regarding the arrangement of objects on the table, which mostly come from etiquette and good practice. Once you have considered these rules, get creative! Color schemes, fabrics, blends of natural elements and original and trendy designs help to define a personal style and to characterize the table, as long as there is overall consistency, to achieve various effects and suggest different atmospheres that will impress diners and improve their experience. In recent times, the minimalism that had characterized the tables starting in 2000 has been superseded by a more informal and less integralist style. The choice of dishes and objects at the table now pays more attention to the material, as it focuses more on the ingredients and origin of raw materials; the aim is then to promote craftsmanship and localism, emphasizing personalization to provide a multisensory experience. But what are the trendy styles and objects on the tables in 2017? Some inspiration can be found in street food, a trend that characterized 2016 and has revolutionized the food habits of many Italians. Why not also bring out these characteristics in a restaurant with stylish plates? The trend in restaurants, has been translated into more flexible service, and here the tablecloths are replaced by placemats, runners, or bare tables; plates disappear and burgers and meats are served on wooden cutting boards accompanied by French fries in steel bins or bags and sauces in mini jars. The “industrial” style is especially beloved, with a vintage or “hipster” touch: tables and stools for the furniture, wooden boxes for bread or sides (used for example as takeaway containers in most modern restaurants that are also shops), cutlery with an aged effect, terracotta or ceramic plates and glasses tinted in pastel shades. If style and demand tend toward to the exotic, bamboo designs, bowls of every shape and color, slate boards and chopsticks. Also trendy jars are used instead of more traditional dishes for serving appetizers or desserts. They are practical and versatile for chefs because they suit both sweet and savory and allow you playing with flavors, textures and colors. From France and Spain come cans or tins (typical containers for tuna or sardines) manufactured by specialized companies, used to serve gourmet dishes. For a more classic style, stainless steel cutlery is always good, with small, simple plates (without logos or names) in white or satin porcelain. If you really want to be daring, you can follow the example of Quince, a fine dining restaurant in San Francisco, that chose to serve selected (and expensive!) place settings on tablets depicting a movie, connected with the type of food served, for a technological and interactive culinary experience. Or, for a different experience than usual, you may serve some courses on edible dishes made of bread or potato starch, accompanied by sweet or savory cutlery, also edible, and fruit peel glasses! One plus is careful packaging of takeout containers (the “doggy bag”); the keywords in this case are sustainability, preferring biodegradable and compostable materials, and originality in offering elegant and practical packages inspired by takeout and delivery. To set a beautiful table, brilliant dishes are perfect… only with Krupps!